More Star Wars drones are on the way. Last year Disney gave the okay for some authentic Star Wars drones to be made by specialist Air Hogs, but if they didn't catch your eye then there are a batch of new ones coming courtesy of US firm Propel. Unveiled at a Star Wars celebration event in London, the four drones match four iconic vehicles from the Star Wars universe: a speeder bike, an X-Wing, the Millennium Falcon and a TIE fighter. 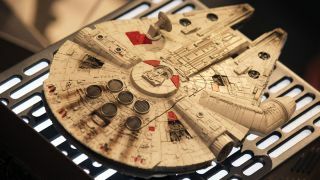 Invisible blades fitted below the drones give you as realistic a flight experience as possible and all these aircraft can reach speeds exceeding 35 mph - the Millennium Falcon model is capable of getting all the way up to 50 mph. Oh, and they shoot lasers and perform stunts too - Propel says you can pit up to 24 different drones against each other, and they're smart enough to vibrate when they've been hit (though they won't end up exploding into a zillion pieces). There are no prices yet but you can put your name down for one on the Propel Star Wars website. These "battle quads" are said to be launching sometime during the autumn or winter of this year but the manufacturer isn't getting any more specific than that. Propel says each model is hand-painted and comes in a collectable display box, so you're probably looking at a cost into the triple figures. Wired is reporting that they won't be available in the US or Canada initially, though we'd expect that to change eventually.